When your child turns 13, they're allowed to progress from pocket money to part-time work. Whether they get a paper round or a Saturday job in a shop, their first experience of employment will be an important step in their personal and professional development. Here's how to help your child find the best job for them. What they can do is determined at a basic level by legal guidelines. On school days, children can't work for more than two hours, and only one hour of that can be before school. During the holidays, younger teenagers can work a maximum of 25 hours a week, whilst older teens can do 35 hours. When it comes to the weekend, 13 and 14-year-olds can work for up to five hours on Saturdays, and those aged 15 to 16 can work for eight. Both groups are only allowed to do two hours of work on Sundays. The National Minimum Wage doesn't apply to school-age children, but once they turn 16 they should be paid at least £3.72 an hour. Saving money they've earned will be much easier if they get to grips with budgeting, so help them to keep track of their finances with our free money management software. 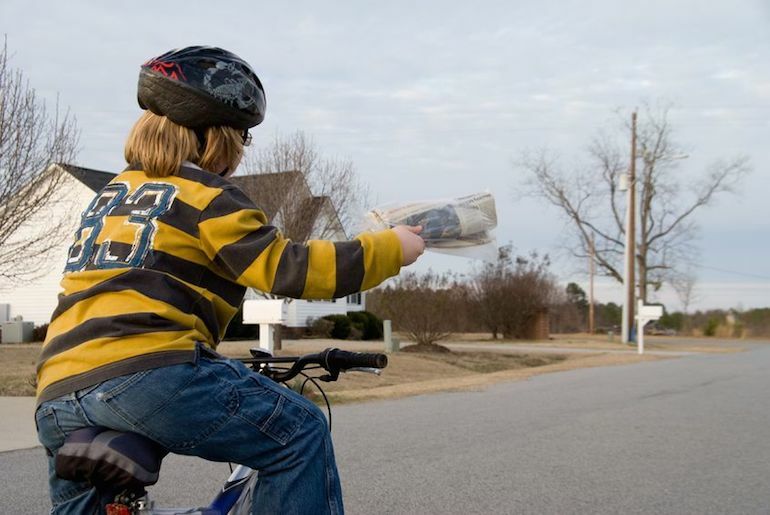 The paper round might be the classic pocket money job, but that doesn't mean it's necessarily the best choice for your child. Their first job doesn't have to set them on their future career path, but it can at least reflect their interests. Perhaps your child is an aspiring foodie, in which case they could get involved in the catering industry by waiting tables. If they're a budding hairdresser, then picking up the tricks of the trade while sweeping the salon floor could be a great starting point. Or if they're interested in going into hospitality, they could look into weekend work at a local hotel. What jobs can't a child do? Everything children can't do is very much common sense stuff. They're not allowed to work in commercial kitchens, factories, fairgrounds or cinemas. Unsurprisingly, they also can't serve alcohol, lift heavy objects, collect money or work in telephone sales. Of course, your child doesn't have to ‘get' a first job  they could create their own. Starting up a business venture is a fantastic way for kids to develop initiative and learn how to save money when balancing the books. If you live in a leafy suburb, why not help your child advertise basic gardening services, such as weeding and leaf picking, at the local newsagent? There are plenty of other odd jobs they could help neighbours out with, like clearing up garages or taking dogs for walks. Another option, particularly during the long summer holidays, is washing cars by hand. If your child gets a group of friends together to help out, they'll enjoy the added benefit of working in a team and managing people  perhaps one day becoming the next Richard Branson or Kelly Hoppen.